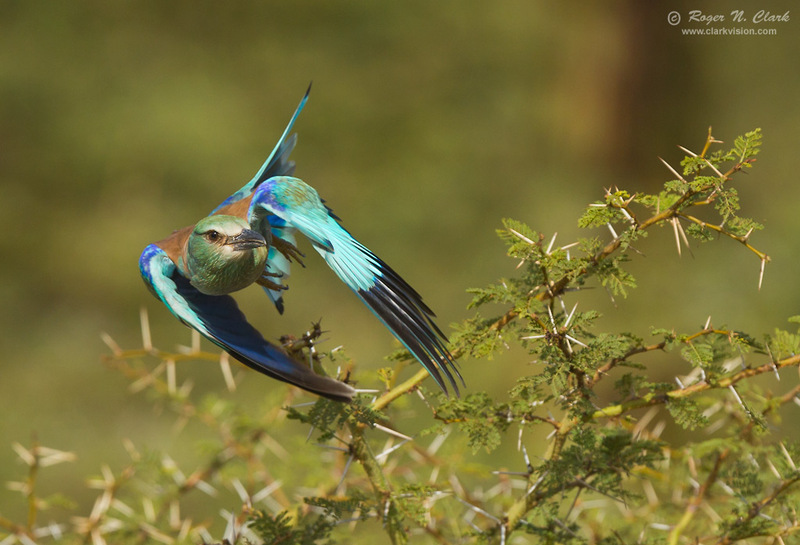 A Eurasian Roller searching for insects in the early morning in Lake Manyara National Park, Tanzania, Africa. This bird was flying in very random directions. Here it is making a fast rapid turn. It takes fast gear, and fast reaction times to capture such images. Technical. Canon 1D Mark IV digital camera, 300 mm f/2.8 L IS lens plus 1.4x TC, 420 mm at f/5.6, ISO 400, 1/2000 second exposure. Exposure Program: Manual. Crop to 8 megapixels. This bird is an extremely fast and erratic flyer, making flight images a challenge, especially against a bright complex background.